Canada's women's softball team has captured the gold medal after upsetting the U.S. 4-2 in extra innings Sunday in the grand final at the Pan Am Games. After finishing second to the Americans at the past four Pan American Games, the Canadian women's softball team has learned how to win. Canada took advantage of a four-run eighth inning and a brilliant pitching performance from Sara Groenewegen on Sunday to beat the United States 4-2 in extra innings and capture its first gold-medal since 1983. "The biggest thing for us is just trusting ourselves, when you haven't won anything, you don't understand what it takes to win," coach Mark Smith said. "This is my seventh Pan Ams and sixth gold medal, I get it and I understand what it takes to win. But they haven't so now they know. We'll be a better team for it going forward." Due to international rules, the Canadians started the top of the eighth with a runner on second base. Natalie Wideman led off the inning with what should've been a routine fly ball, but American shortstop Kellie Fox lost it in the sun. Three batters later, Joey Lye singled home Canada's first two runs of the afternoon. "When you come out into the elements, those are all things you take into consideration," said American coach Ken Eriksen. "Tough break. Unfortunate it got caught dead in the sun. The only ball of the day that was dead in the sun." After Kaleigh Rafter was intentionally walked to load the bases, Jennifer Salling's sacrifice fly scored Jenn Yee. Erika Polidori followed up with an RBI single. The Americans added a pair of runs in the bottom of the eighth, but could not complete the comeback. Groenewegen went the distance striking out seven while allowing one earned run on six hits. "I just came off a season from school and I pitched a lot of innings there. I pitched seven inning games all year so I was ready for it," said Groenewegen. "This is the best game we've played all year and it's perfect timing." GOLD BABY!!! Love this TEAM!!! American left fielder Michelle Moultrie, who went 1 for 3 against Groenewegen, said the Canadian was on her game. "She did a good job of hitting her spots and sticking with what was working," said Moultrie. "Her change up was really good today and she just did a really good job of mixing and sticking with it. Throwing change up after change up or three change ups in an at bat - things like that. If it's working, then you've got to stick with it and so she did a great job of that." U.S. pitcher Jaclyn Traina took the loss. It was the third time the North American rivals faced off at these Games, with the U.S. winning 7-0 in the preliminary round and 5-2 in Friday's semifinal to advance directly into the gold-medal game. Canada needed a 7-4 win over Puerto Rico in Saturdays' bronze medal game to advance to the final, but dealt the U.S. its first loss at the tournament with the gold medal on the line. 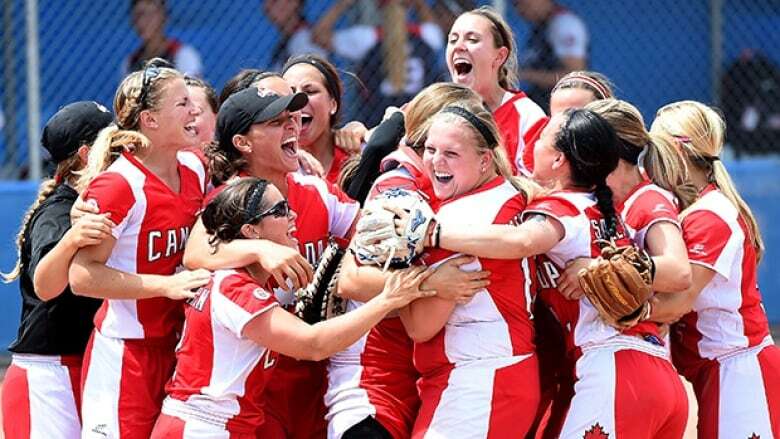 With Sunday's victory, Canada swept the softball titles at the Games. The men won gold a week ago with a 2-1 victory over Venezuela.